How do you sum up a year-long experience where you’ve worked with a team of others, traveled to multiple countries, and examined solutions to some of the biggest challenges in the world today? This is exactly what we asked the students in the i-Lab to do on September 13th—in five minutes or less, in front of the entire Keough School. 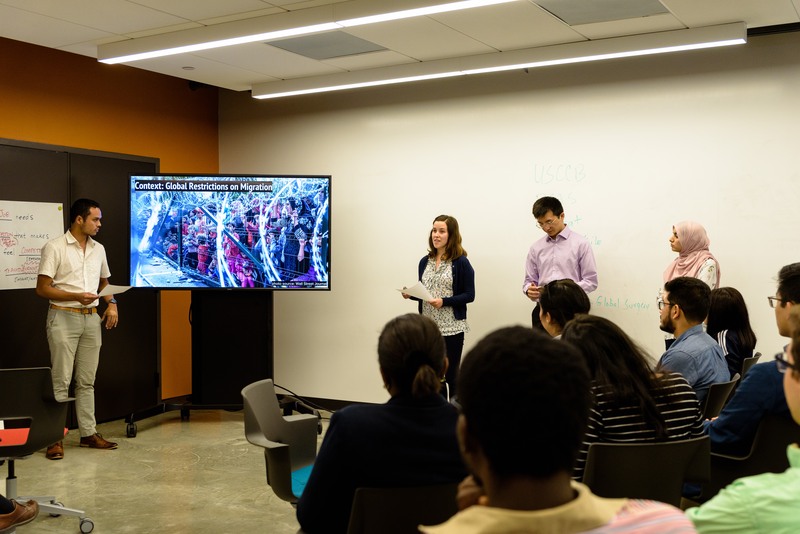 Over the summer the i-Lab sent 23 Master of Global Affairs students, in 7 project teams, to 14 countries across 5 continents, to work with organizations on the frontlines. 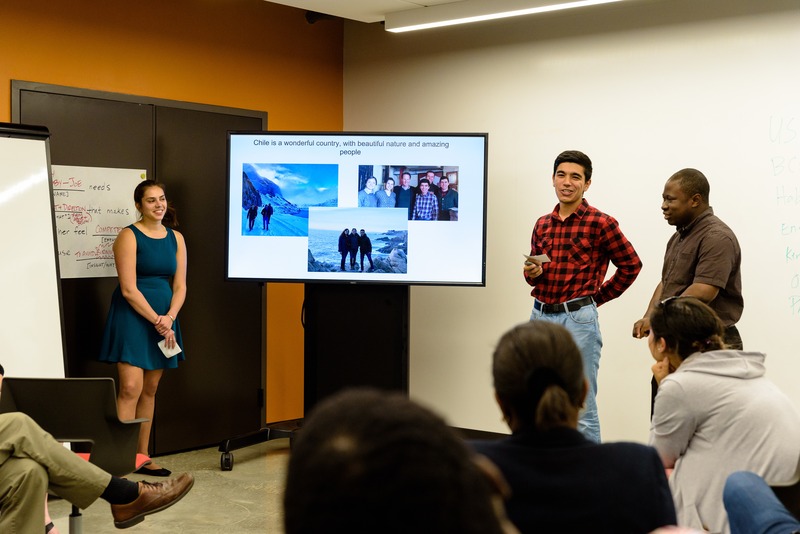 Upon their return to campus, we gathered in the i-Lab space to let students tell their stories, explain why their projects are so important to their partner organizations, and discuss what they learned in the field and the impact they hope to achieve. Chista Keramati and Jamie McClung traveled to Bangladesh to investigate policies and programs aimed at reducing the vulnerability of women to climate change. 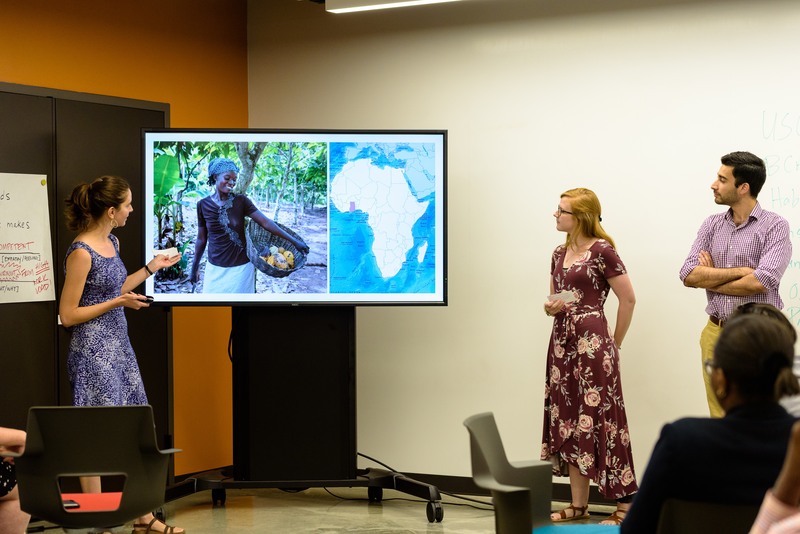 They traveled to four different areas of the country to understand the effect of floods, cyclones, and changing weather patterns on local populations. They specifically observed how climate change affects women and their livelihoods, and explored the potential of leveraging underutilized systems, like the madrasa system, to further climate change education. Chista and Jamie are creating a report that BCAS will use to advocate for policy recommendations in Bangladesh. 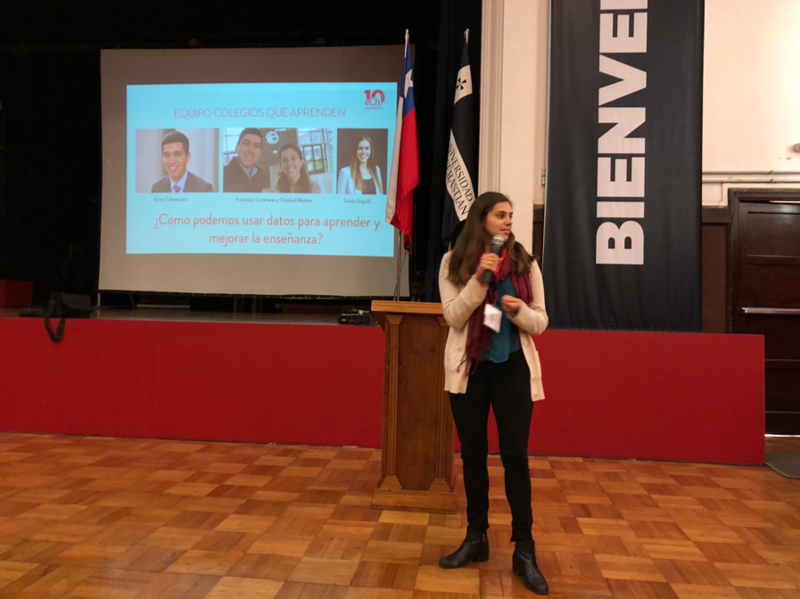 Ikromjon Tuhtasunov and Sonia Urquidi traveled to Chile to look for ways to help teachers enhance school performance and build school cultures that foster innovation and learning. They visited dozens of schools and conducted over a hundred interviews to gain an on-the ground, culturally-informed perspective of classroom dynamics and teacher performance. Meanwhile, Nnadozie Onyekuru partnered with Alliance for Catholic Education at Notre Dame to understand best practices that might translate to Chile. The team is assembling recommendations for incorporating positive feedback loops within schools. 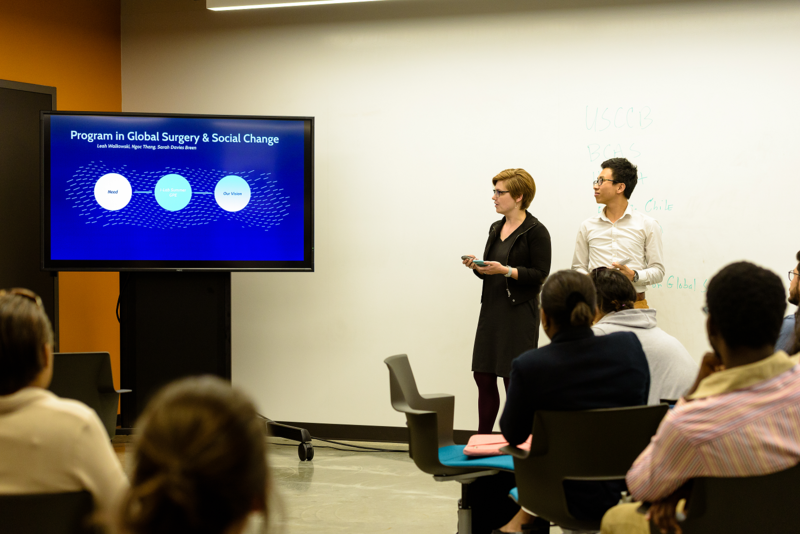 Sarah Davies, Ngoc Thang, and Leah Walkowski traveled to Ethiopia, Tanzania, and Sierra Leone, respectively, to understand how to best catalyze and mobilize worldwide improved access to quality surgical care. Each of these countries provided a case study for different levels of adoption of safe surgery policies. The team conducted interviews at the national, regional, and local level, and toured facilities to gain a clear understanding of what is working and what opportunities still exist. Sarah, Ngoc, and Leah are currently developing case studies that will help PGSSC better promote safe surgery in other countries around the globe. 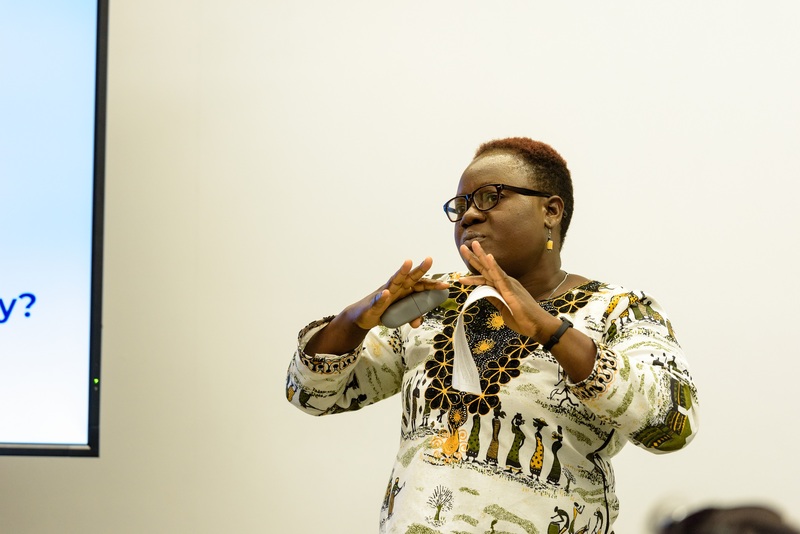 Caroline Andridge, Sofia del Valle Trivelli, and Mian Moaz Uddin respectively traveled to India, Ghana, and Malawi to understand how best to adapt global supply chains toward a more sustainable, equitable food system. They worked to trace products, like sugar and cocoa, from the farmer to the producer in each country’s context. Caroline, Sofia, and Moaz are creating a report that will allow Oxfam and the “big 10” food and beverage companies to tailor sustainability strategies to local contexts. Asmaa El Messnaoui, Dorcas Omowole, Loyce Mrewa, and Rhea Fe Silvosa traveled to Kenya to develop scenarios for the future of Kenya’s devolution—transferring power to local levels in a way that promotes democratic participation, equitable distribution of resources, and peaceful conflict resolution. The team conducted interviews with officials at all levels of government to understand the various perspectives on devolution efforts in multiple counties around Kenya. The team is in the process of identifying the key drivers of positive devolution by understanding the underlying motivations for various stakeholders. They are developing targeted short-term policy options and advocacy messages to drive higher, more sustainable, and more equitable development and peace outcomes. Patrick Calderon, Kathleen Kollman, Shuyuan Shen, and Mehak Anjum Siddiquei traveled to the US/Mexico border, thento Greece, Germany, and Switzerland to explore and document complex immigration enforcement systems. The team conducted interviews in areas most affected by current global migration patterns, specifically looking at best practices in respecting the human rights of immigrants. 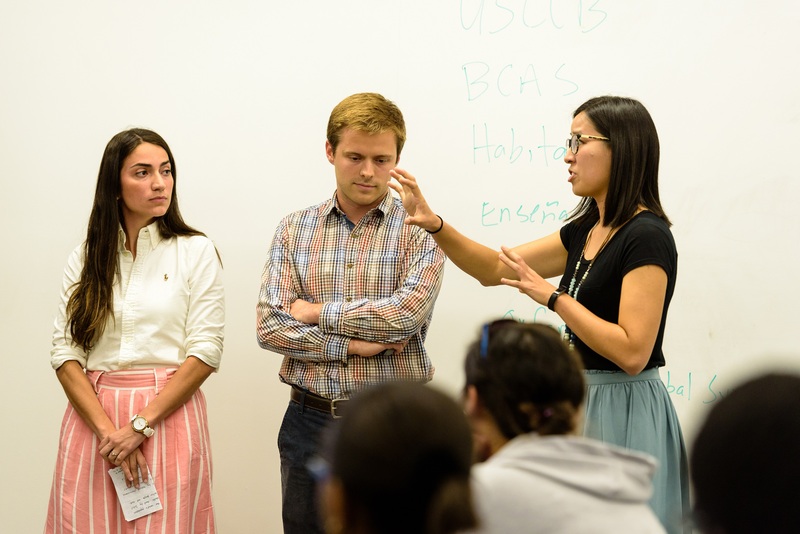 They have already shared their initial findings through a stakeholder conference in Washington, D.C. Patrick, Kathleen, Shuyuan, and Mehak will continue the comparative analysis of U.S. and European contexts and build a report capturing best practices. Jiyeon Ahn, Juanita Esguerra, and Steven Wagner traveled to the Philippines to look for opportunities to enhance the resilience of local housing markets essential to delivering safe and dignified shelter. The team mapped the local markets that provide materials for housing construction through informational interviews and key stakeholder engagement in communities still recovering from Super Typhoon Yolanda. They are now developing a tool that will enable organizations in the Philippines and around the world to more effectively assess local market readiness to react to disaster, identify critical commodities, and develop appropriate interventions to strengthen them. 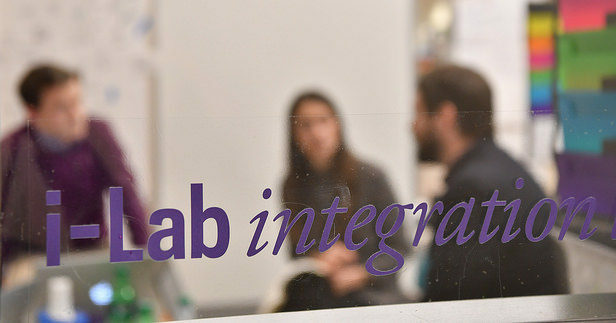 Both the partner organizations and the students are finding the i-Lab global partner experience to be a unique and perspective-altering engagement. Partners value the extended duration of the partnership, as well as the skills, passion, and level of professionalism our students bring to the table every day. 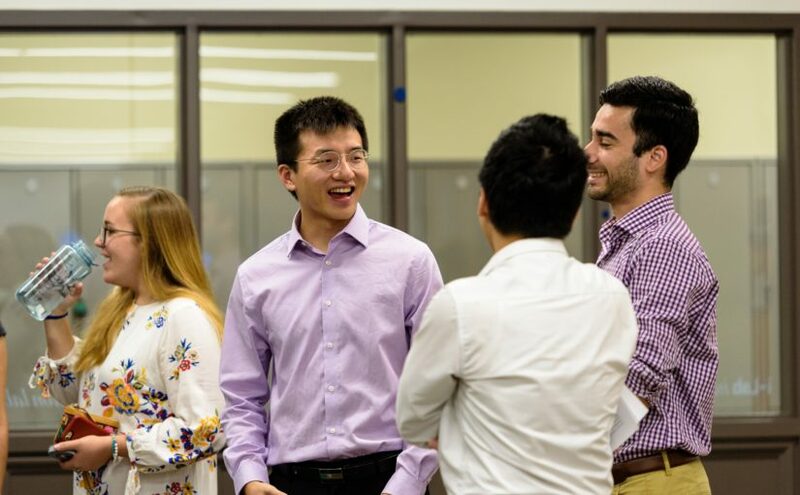 Students have consistently talked about the advantages of this more consultative-style educational experience and the value of designing, planning, and executing their own strategy. Throughout the fall, the students will consolidate their findings and deliver their final product to their partners. Everyone involved seemed to learn a lot, and the i-Lab staff and faculty are incredibly excited for the next two semesters, when the students will translate their deep understanding of the situation on the ground to policy conversations in Washington, D.C.
Thirty-three interviews, three focus groups, and eleven classroom observations later, the Enseña Chile team’s eight weeks in the field has come to a close. I write this from my host family’s house as my host dad watches rugby in the living room, both of us bundled in our jackets, as the house is nearly the same temperature as the winter air outside. As I sit down to write, I realize that I’ve barely had a second to myself to reflect on this experience; I’ve been too busy working and exploring Chile with family or friends. Despite the exhaustion, I feel incredibly fortunate for this busy yet fulfilling experience I’ve had here. As I think about what to write, I feel I should address three major things: Our project, of course, some things I’ve learned about education, and the thing for which I am most grateful—the people. To provide some context, Enseña Chile is an organization modeled after Teach for America in the U.S., and is part of the Teach for All network. 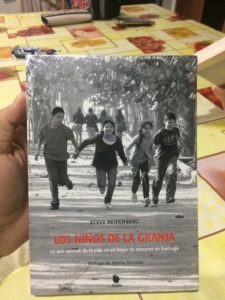 This organization selects talented university students (who have not studied pedagogy) to spend two years as teachers in vulnerable schools across Chile. 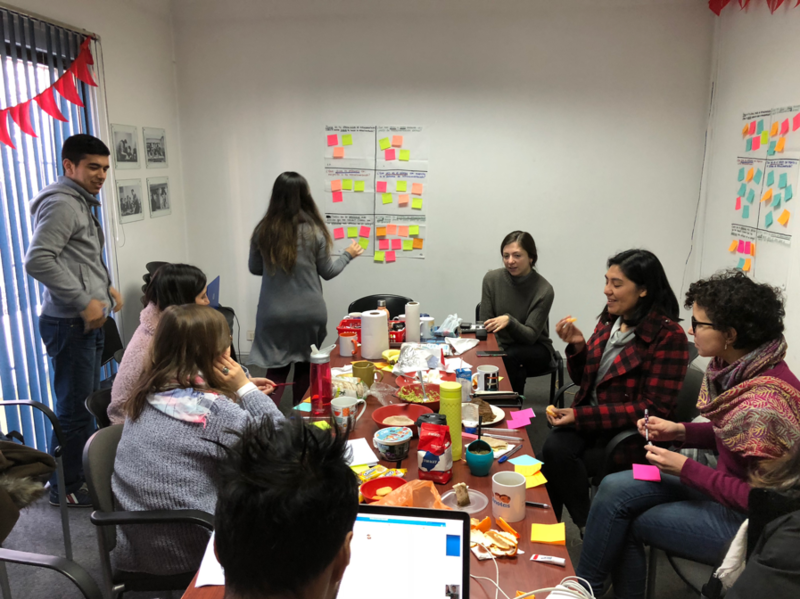 Our work, in particular, relates to a relatively new project, “Colegios que Aprenden” (“Schools that Learn,” in English), in which Enseña Chile hopes to create a consultancy model that helps schools achieve continuous improvement based on concrete evidence. Therefore, our fieldwork is centered on the following question: How might schools achieve continuous improvement, using data and evidence, to enhance student learning? This is a broad and daunting question. Where would we start? 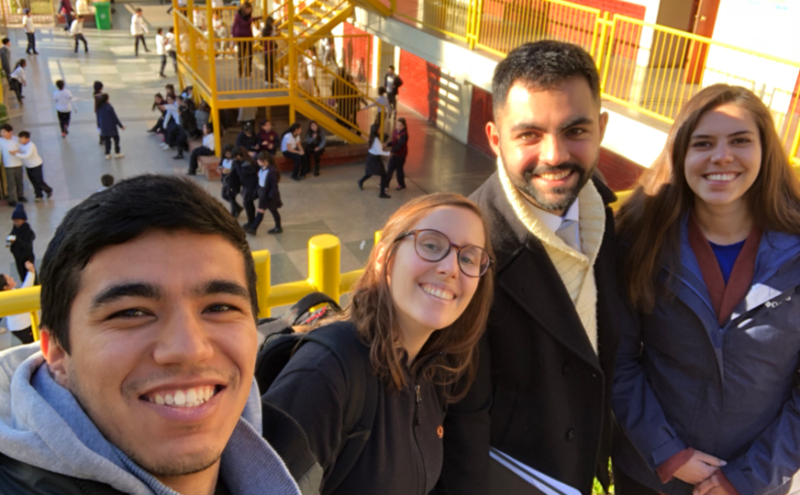 With the help of our dedicated and kind Chilean team members, Trinidad and Francisco, we began by visiting schools and talking to relevant stakeholders to learn about current feedback systems in Chilean schools. Based on our conversations and observations, we gathered ideas about how to improve these systems. We visited schools in three major cities: Valparaíso, Concepción, and Santiago (our home base) in order to gain perspective about distinctive regions in the 2,653-mile-long country. 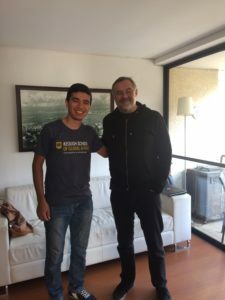 The interview questions changed throughout the process as we uncovered major themes or discovered new questions, and the Spanish became a little less daunting as I gained practice. I was delighted by the enthusiasm and openness of the teachers and school administrators who carved out anywhere from fifteen minutes to two hours to talk with us. 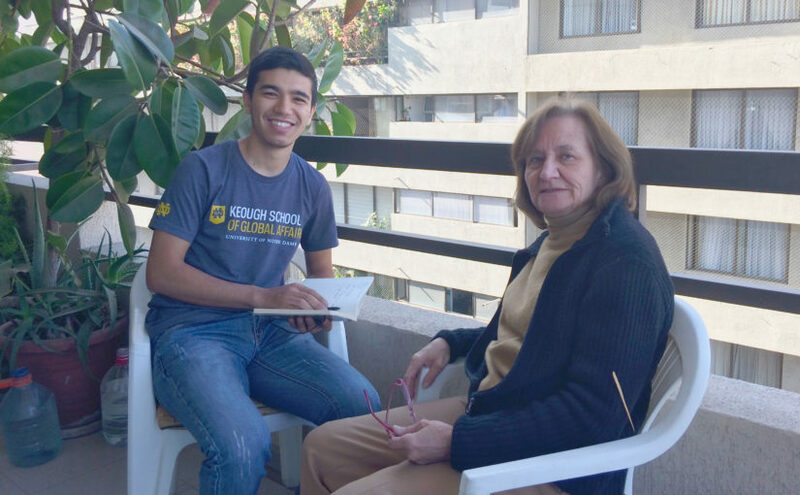 A focus group with the mentors in the Santiago region of Enseña Chile. Mentors visit classrooms and give feedback to Enseña Chile teachers. We realized they could teach us a lot about how to conduct effective observations and give constructive feedback, so we decided to gather them for a focus group. 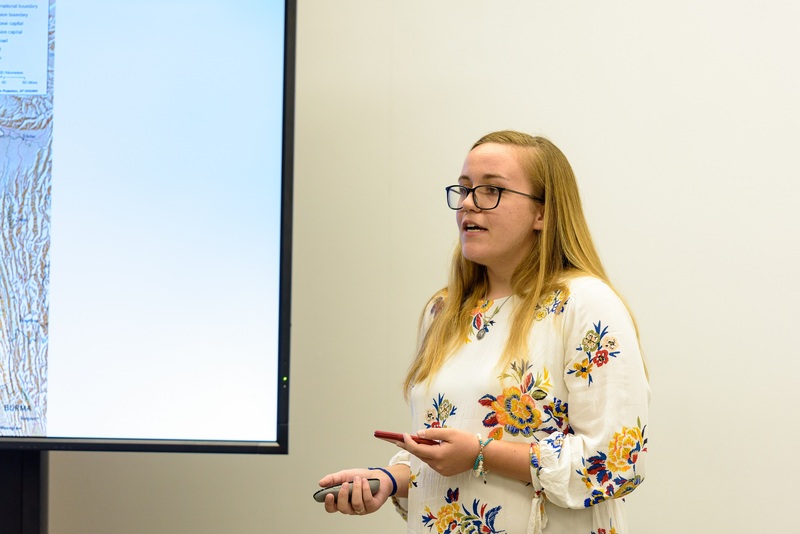 As was the case for some of our classmates in the master’s program, our team’s research didn’t require us to confront overly sensitive or urgent topics. Our questions were along the lines of, “What is your relationship like with other teachers?” or “How do you know that your students have learned the class material?” While these questions didn’t seem pressing, I was reminded in each interview of the fact that every student’s future depends on the quality of his or her education. From this I began to comprehend that this work should, indeed, be approached with a sense of urgency. Many of the schools where Enseña Chile teachers work have a high percentage of students from vulnerable communities. For many of these kids, when home doesn’t offer a safe, loving, or stable environment, school offers solace. As science teacher, Sebastián told me, “My priority [is] to construct a safe place for them…to form a family.” For these kids, ensuring—as soon as possible—that school is a place of caring and love, and that their education can give them the power to transform their own lives, is urgent. It’s urgent in Chile and around the world. For those of you from the U.S., I ask you to think about the impact of gun violence in our schools, for example. Where do we expect our children to learn if they feel unsafe at home and at school? Me, giving a very brief overview of our research to the teachers within the Santiago region, essentially advertising the project in hopes of gaining interest for interview and focus group participants. As interesting and challenging as this research has been, what is most imprinted in my memory are the people I’ve met here in Chile. Just the other day, Enseña Chile celebrated its 10-year anniversary with a day-long celebration. Teachers, school administrators, and funders from all over Chile gathered to converse and attend workshops. As I glanced around the auditorium at the event, I realized how many people Ikrom and I have had the fortune of meeting—teachers with whom we spent hours chatting in Concepción, a school administrator from Viña del Mar who invited us into her home, several mentors who let us spend the night in their apartments, and all the Enseña Chile team from Santiago. In two months, I went from feeling a foreigner to a friend. And when Enseña Chile uses their slogan “somos red,” (“we are a network,” in English), I feel that I am a small part of that human network. 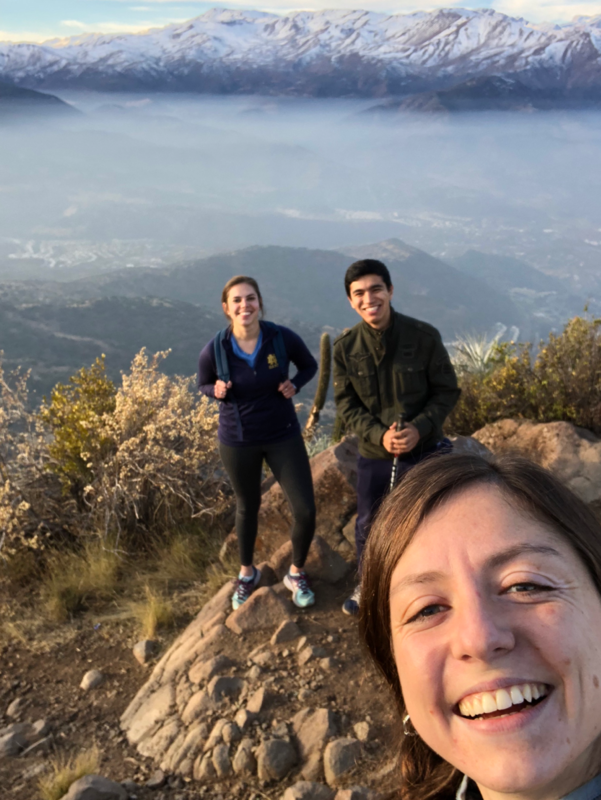 A fantastic hike up Mount Manquehue in Santiago with our kind and adventurous coordinator, Trinidad.